A s a kid growing up in suburban Wisconsin in the ’90s, a “surprise, we brought home pizza!" from the adults in the house meant a couple of stuffed crusts from Pizza Hut. Luigi Roditis, who now makes his own pizza at nine-month-old il Romanista in Los Angeles, had it a little better during his childhood. 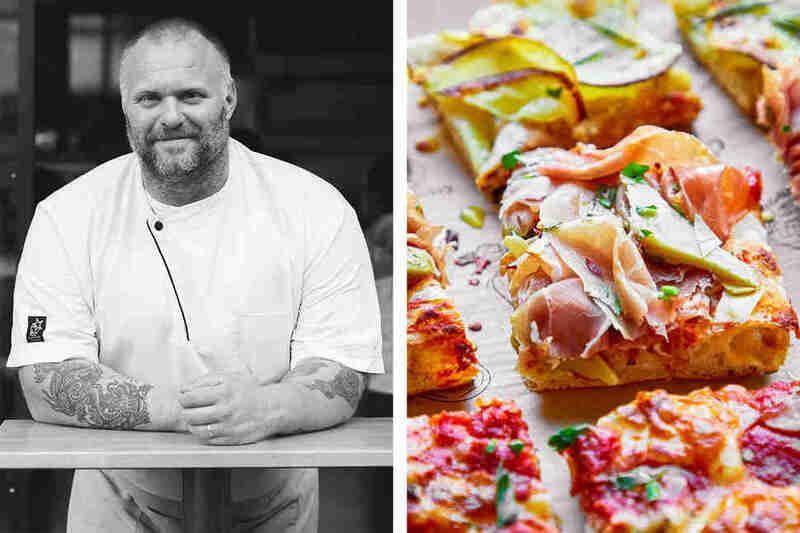 The LA native spent summers visiting relatives in Rome, where his maternal grandparents would disappear in the mornings and come back with a pizza called al taglio. It was a beautiful contradiction: a crisp bottom crust topped by light, airy dough laced with delicate holes, like the inside a good loaf of bread. “We’d have it with lunch, or as a snack after lunch,” Roditis says. No, the guy didn’t just have the world’s coolest family (no offense, Roditis clan). His story is a common one in Rome, where you can’t walk more than a few blocks without stumbling across a small shop offering rectangular trays of pizza al taglio, some topped simply with tomato sauce (pizza rossa) or olive oil and sea salt (pizza bianca), others jazzed up by eggplant, zucchini, potato, and rosemary, or prosciutto cotto. Use your hands to convey how big of a portion you want, and the pizzaiolo cuts the dough with scissors (al taglio means, literally, “by the cut”) and charges you by weight. “This is Roman street food,” Roditis says. “But I don’t live in Rome,” you say. Also a common story. Here’s where you’re in luck: You, too, can now be the hero who brings home pizza al taglio, if you’re in Chicago, Miami, New York, Philadelphia, San Diego, or LA, where ambitious pizza makers, including Roditis at il Romanista, have recently brought the distinctive style to the States. And this is just the beginning. 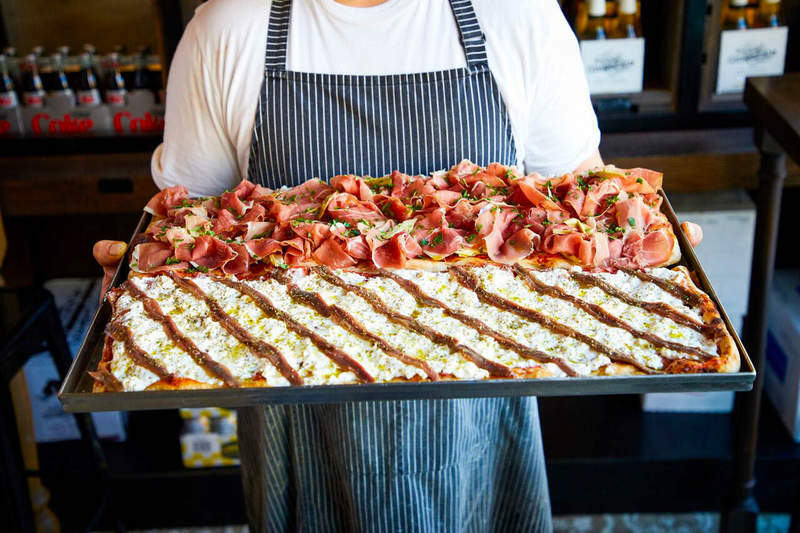 Triple Beam recently added James Beard pedigree to LA's Roman pizza scene. Bonci, the direct-from-Rome al taglio shop now with two locations in Chicago, is aiming for 100 stores in the US throughout the next few years. Meanwhile, there’s an entire school in Miami dedicated to teaching chefs the right way to make al taglio, called the Roman Pizza Academy and spitting out alumni who are opening pizzerias in Arizona, North Carolina, and beyond. What sets al taglio apart from its pizza siblings is the dough, which is made with more water than most. It’s also cold-fermented, meaning that you stick it in the fridge to rise. This combination results in some pretty fun science we’ll no doubt oversimplify here: The chilled temps slow down the yeast’s job without halting the work of the enzymes that break down the gluten during fermentation, so more gluten proteins are broken down -- yielding a less dense, more airy dough -- by the time your dough blob achieves the desired rise. This can take up to 96 hours, which is a really long time in pizza years. 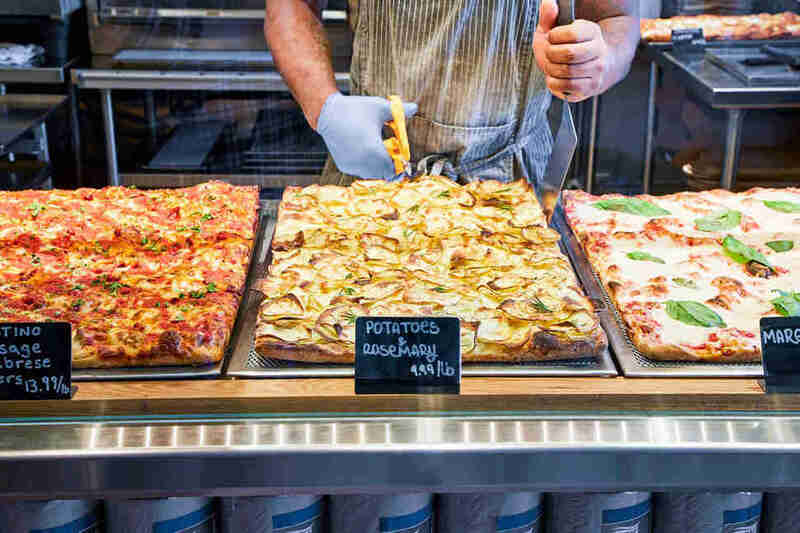 When you survey the glittering landscape of pizza-behind-glass at an al taglio shop, all of that baking -- roughly 15 minutes a pan -- has already happened. You can either warm your chosen pizza at home, like Roditis’ family did, or have the pizzaiolo pop it into the shop’s front oven, a la a New York slice, so you can more quickly stuff the carbs into your gullet. If you’re taking friends out for al taglio and trying to drop some knowledge, two names you should know are Angelo Iezzi and Gabriele Bonci. The latter runs a place your Rome-visiting buds have likely bragged about going to, Pizzarium, where he makes not-quite-traditional al taglio, using more dough per pan to get a sky-high rise with crazy honeycomb action. Anthony Bourdain loved the guy. 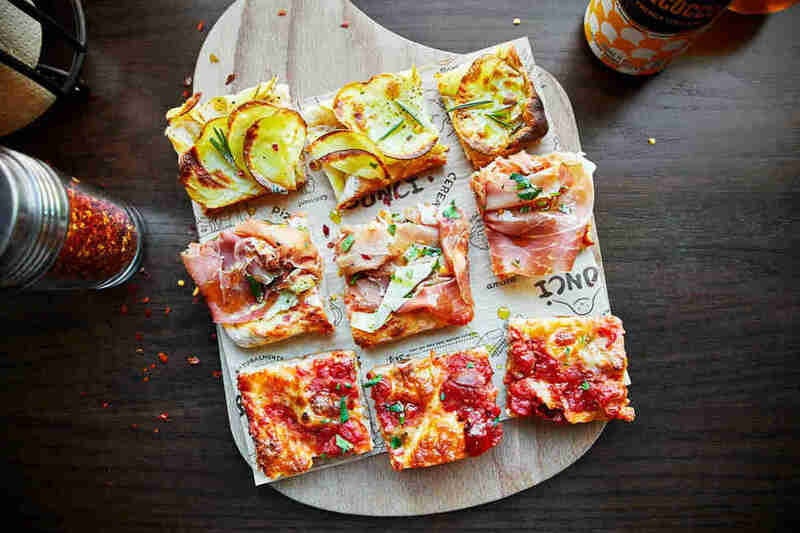 In 2017, Bonci partnered with former Buca di Beppo CEO Rick Tasman to open his first pizzeria in the US -- the aforementioned Bonci in Chicago -- and people went crazy for slices topped with everything from scrambled eggs to meatballs bathed in cheese. A second Chicago location opened in April. Iezzi, who runs a pizzeria called Angelo e Simonetta in Rome, is credited with inventing the high-hydration, slow-fermentation process in the ’80s -- considered controversial then, but now widely accepted. “Angelo changed this [style of] pizza,” says Fabio Casella of New York’s San Matteo Pizzeria, who just partnered with Iezzi to open PQR, short for Pizza Quadrata Romana, on the Upper East Side in March. PQR sells its al taglio by the slice, not weight (“people in New York are used to pizza that way,” Casella says), but it’s still legit. Casella says the shop is already scouting its second location, likely in Brooklyn. But when it comes to pizza al taglio in the US, we need to rewind for a second. In Miami, Massimiliano Saieva sits as a quiet pioneer; he’s been making the pizza for six years at his own spot called Pizzarium (not affiliated with Bonci’s spot in Rome). About three years ago, Saieva joined forces with Manzo to open their growing pizza academy, which offers classes for industry and laypeople alike. Manzo, whose father grew up in Italy, complains that as tourism has grown in Rome, so has the number of pizzerias trying to take advantage of tourists by offering bad pizza al taglio. “You have a lot of people coming in trying to make a buck, their pizza looks great and the average tourist doesn’t know better. It’s putting artisans out of business. What I see in the United States [right now] is quite the opposite. People are focusing on quality.” In other words, these beginning stages of pizza al taglio are, no doubt, going to be the best for us. Give it a few more years, and you may be seeing cut-rate pizza al taglio at the mall. “It presents itself well to what we want as Americans -- you stand in line, you pick, you see what is there,” Manzo says. “It’s a great product for malls, airports, anywhere that’s high-density, high-traffic.” Just remember: The day Starbucks adds a plastic-wrapped al taglio square to its coolers is the day this pizza has jumped the shark. Marissa Conrad's deep love of dairy started in Wisconsin and now resides in Chicago. Follow her @Marissa_Conrad.